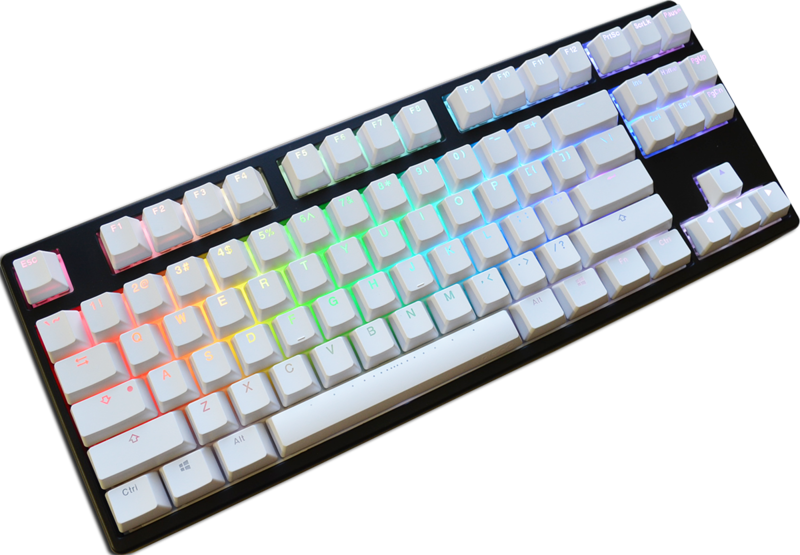 MK partnered with Ducky on the Disco so we could build the ultimate RGB TKL keyboard. 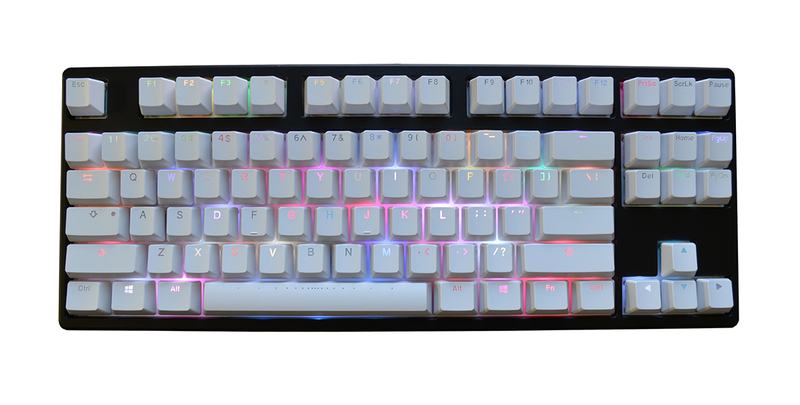 We took our favorite TKL case (Shine 3), designed a custom dual-layer PCB to utilize the incredible RGB lighting functionality of a Shine 5, and combined them with Ducky's super-sharp ABS keycap legends for superior readability. Keyboards, quite simply, don't get much prettier than this. 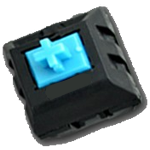 The Disco is available with the new Blue, Brown, Red, and Black KBT switches. 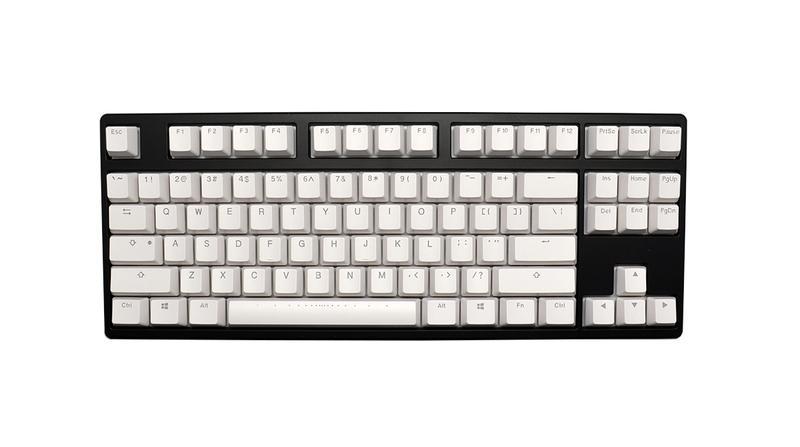 As with all MK brand keyboards, the Disco comes with the MK Guarantee which extends the MechanicalKeyboards.com return window from 30 days to 60 days and adds a full year to the keyboard's standard warranty. Dimensions 14.20" x 5.50" x 1.70"
Excellent! The LEDs are bright and colorful and really make the keyboard pop! I didn't like that the colors and birghtness was controlled through the keyboard itself at first, but it's much more intuitive and easy to use than I thought. The keycaps feel really sturdy and well made, and they have a very slight texture to the top of them which feels really nice. The switches themselves are (of course) clicky and extremely satisfying (didn't realize just how loud Blue's actually were). Sturdy and well constructed, 10/10 would buy again! First time customer of MK.com and will definitely be coming back. Paid for the $4 shipping and it showed up in 2 days. Zero complaints! My first mechanical keyboard was a Corsair K70, I've had it for 4 years. Like the other reviews, doesn't feel cheap. I am still skeptical though since it is not a aluminum frame or housing, but since this keyboard is customizable. , I liked it. I love this keyboard. I've been using it for almost well over a year now. No problems with the lighting, no problems with the switch, the keycaps are still 100% intact. Definitely recommend this keyboard especially if you're looking for a cheap, well made keyboard with a little wow-factor. 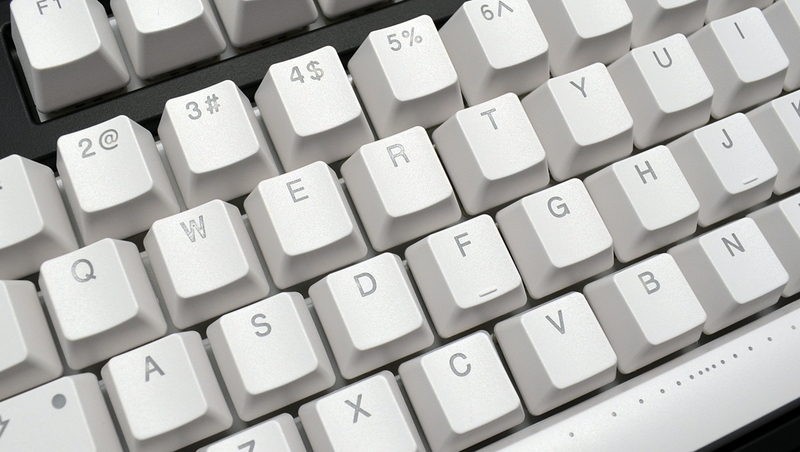 The ONLY ISSUE I can think of is the white keycaps and how they get dirty fairly easily. I picked white knowing this so its not a problem for me but it could be for someone else. The plus is that they clear fairly easily. Keys are dying within a year gonna have to retire this keyboard already. Don't listen to some of the reviews on here. I got the keyboard and I can confirm that it doesn't feel cheap or like its poor made. The blue keys felt good, cant say about the other switches. The only complaint I would have about the keyboard, is that sometimes (maybe when i'm spamming it) the space bar gets stuck, perhaps it was a error in production , either way it is temporary and can be easily fixed. Coming from owning a Razer Blackwidow mechanical keyboard I can happily say this is a big upgrade. This is for anyone who wants a simple Tenkeyless Full RGB Keybaord for a cheap price might I add. had this keyboard less than a year and the keys are intermittently disconnecting back to my old 6year old keyboard. Honestly super underwhelmed on ths product. I have 4 keybords, all have had zero issues, hoever this is the first one with KBT switches I have tried. They keyboard itself don't feel solid. I willing to exept that since its not a metal case. However when I went to swap keys I have the F10 insides just pop out. I use keycap remover I am very gently with my keyboards. I also tried to see if we could get resolved support but my warranty don't cover this apparently. This the last time I'll buy anything with KBT switches, and the last time I'll buying from mechnical keyboards because in mind if you're obviously faulty switch fail the first time key caps removed in a hobby where swapping key caps key its obviusly not a god bet. I am very happy with this keyboard overall. Very smooth typing and great overall build. It feels very solid with absolutely no flex at all. The space bar is the best I have had on any keyboard ever. Very smooth and consistent no matter where you press it. Even the lighting profiles are pretty easy to set up and adjust once you get used to it. I will however warn that the shipping to Canada was very expensive relative to the cost of the keyboard. So if you live in Canada watch out for that. I was a bit hesitant to purchase this keyboard initially. What mostly drove me off was the lack of genuine Cherry MX switches. 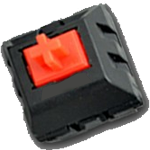 I was kind of in the mindset that it was Cherry switches or nothing, and that my mind was firm belief for some time. However, once I sucked it up and got the keyboard, I ended up falling in love with it. I initially was going to purchase the regular black key cap version but I wanted something different. And just. wow. Absolutely beautiful keyboard. The lighting is everything I would want and more. I'm a simple man, just give me RGB lighting with enough lighting effects and I'm happy. And now with the switches. I didn't think I'd ever say this, but I'm pretty sure I prefer this switches over Cherry MX switches now haha. There definitely is a difference between them, don't let some people fool you. I'm coming from Cherry MX Browns and using KBT Browns. 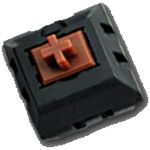 The KBT keys are firmer, while still having very similar actuation to Cherry MX. They're also so much smoother than Cherry MX. With my old keyboard, I can always feel a bit of scratchy-ness in the key travel after the tactile bump, and this just isn't the case with these KBT Keys. They're also decently quieter than Cherry MX too. 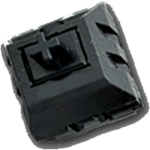 To sum it up, if you're worried about this keyboard because it isn't Cherry MX switches, rest assured you have no reason to worry. This keyboard is splendid and I can't recommend it enough. I certainly hope this keyboard stands the test of time. This keyboard is just awesome. I went to the store and Justin helped me type on I forget how many different TKL models, but this one really feels fantastic. So happy I bought it, and kudos to the staff for their patience with me as I walked in with just a head full or research, but I walked out a happy customer! My first mechanical keyboard was a Razer Blackwidow with cherry blue keys. I really liked the mechanical keys, but the clicking started driving me and others crazy, so I went to the Corsair K70 with brown switches. This keyboard was great, but the tactility of the brown switches felt almost like the switch was dirty. I went to a Happy Hacking Keyboard Pro 2 for the topre switches, and while they were nice, the layout and size was problematic. It was small, but the function layers and lack of arrow keys were missed more than expected. In the end, I bought myself this keyboard with Gateron red switches. If you are unsure of what keyboard to get, buy yourself an MK Disco. The linear switches are great for both gaming and typing. A lot of people say the tactility is important so you know when the key actuates, but since I bottom out my keys with almost every press, that's not an issue for typing. In gaming, I also have no issues pressing keys consistently. Great product, and the lighting with the white keycaps is great (the keycap quality seems great as well).